Welcome to the Devon Angling Association website. The Association offer fishing on approximately 15 miles of the River Devon in Clackmannanshire and Kinrossshire; from below Castlehill Reservoir in Glendevon to Menstrie . The river provides good opportunities to catch migratory Salmon and Sea Trout, particularly in the later part of the season and the river holds excellent hard fighting native Brown Trout all to the stunning backdrop of the Ochils. Additionally the Association is able to offer members and visitors bank fishing on Glenquey Reservoir in the heart of the Ochils. The website is intended to provide information & news for members of the Association, provide a guide for visitors to the Devon & Glenquey and hopefully be of interest to all. All Salmon caught on the River Devon must be returned to the river without exception. For the latest news of the Association , River Devon & Glenquey plus other related snippets please see the DAA News & Blog tab. Up the quay last night, had 3 , all on a wet winged claret coloured fly on a floating line, medium figure of eight retrieve. Tried a few different flies but this seemed to do the trick. Very few fish rising. Work party have done a great job up there making fishing the north bank easier. Thank you to the DAA for my free day permit for the Quey. You have to be in it to win it! Enjoy your day – the committee will be in the Muckart Inn waiting on your return !!!!! Heading up there next week so thank you for your efforts. Anyone have comments on how nthe Quey is fishing in this hot weather. Tactics? Evening folks, just a wee heads up for the older generation that the gate which allows access to the river/fields heading downstream towards the crook off Devon ( the first gate you come to when you park at the salmon hatchery ) no longer can be opened and shut….I had to climb over the gate tonight! The river seems too have picked up, lots off fishing on the move particularly early evening! Klink and dink being successful although in the deepest pool the weed can cause a few problems! This new comment was buried at the end of a thread on this page, so I have taken the liberty of bringing it to the front of the page! Hi I will be rejoining the DAA after a gap of 20 years. I was wondering what are the best beats for flyfishing for trout these days. I used to fish Fossoway beat but I heard that had a bit of a disaster a few years ago when all trout were killed. I also fished Vicars bridge downstream towards Dollar. Never fished from Tillicoultry downstream, what are the best beats. Andy. Andy welcome back to the river ! Be assured the Fossoway beat has recovered from the fish kill caused by Scottish Water allowing Sulphuric Acid to spill into the Devon. It needed a few years of serious R&R, but is well worth a visit. I personally favour the fossoway stretch, as it holds some lovely fish that can on the right day be risen too dry fly ( if that’s what your into ) although up and down the river the fishing is good! Hope to see you out on the river rolling back the years! Yep hopefully be on the river some night next week and the Quey at the weekend. Tight lines , Andy. Noticed the last couple of evenings on my way home from work, swarms of black headed gulls feeding on the upper Devon (particularly in Glendevon); a sure sign of sedge hatches …….. worth checking your box to make sure you have a few sedge patterns with you! The river is very low, even ankle deep in many areas, making fishing difficult in the bright sunshine. Most of the fish have moved back to the deeper pools or are lying in sink hole depressions on the bottom. While Euro nymphing at Tates during early afternoon, I managed four, and then moved up to Fossoway to finish the afternoon and fished the duo on a long leader and had another seven. Extremely hard going. The river desperately needs a good flush out. Spring was late this year, meaning that the fish were late to come on. Now that they have, we now have very low river levels, making fishing difficult. We just can’t win! I encouraged a number of anglers from my nymphing group to buy season permits this year and I’m desperate to show them round this wee gem of a river. Let’s all do a wee rain dance lads please! I was around Taits Tomb week past Friday. Incredible hatch of all types of flies, river as low as I’ve seen in 50 years of fishing it . Only saw two or three fish rising. A couple of chaps looking for beaver signs tramped by and spooked the only better looking fish ! Had a bump or two from wee fish. Cul de Canard size 16 with a 22 Olive nymph dangling below. They hit the olive Cul de Canard. Nothing offered when I put on a Gold bead pt nymph size 18 to try the deep holes. I was fishing a similar set up up at Fossaway and only 2 fish took the dry. The rest were caught on a wee double bead nymph. At Tates I caught all my fish in the deep corner pool on nymphs as they were lying tight on the bottom in the bright sunshine. Lowest I’ve seen it too in years and it desperately needs rain. A good hatch of Olive Uprights late afternoon, but no interest shown, mainly because the fish had moved out of the now very shallow Summer feeding zones. I’m pleased that there was a no stocking policy this year and I hope that continues, but some form of safeguards in the busier areas such as at Tates might have to be used to help protect the fish if the river is to become a truly wild trout stream. Simple things like catch and release and barbless hooks are a good start until the river is self sustaining. Yes, signs of fires and beer cans all around Taits, up and down. Lots of evening or night bait fishing by the look of it. Permits ?? Only the decent anglers who care about the river and the countryside will bother to buy a permit. I threw a can at a cheeky wee f****r who walked away leaving all his crap in a heap. He won’t do it again. Was out for a few hours yesterday, Mayfly hatching, later on some Mayfly spinners……..some big trout rising, but I couldn’t entice any. Terrific hatch yesterday of the true Mayfly Ephemera Danica. The big creme coloured beasts were everywhere on the Tates stretch leading back down stream. Great to see these insects here on this beat. Some splashy rises from the fish chasing the big nymphs as they ascended to hatch. I had some really nice fish and my tally came to eleven, which was good considering the very low water and bright conditions. I sincerely hope that the association don’t stock again next year. This is a magic wee river that deserves to run wild and there’s more than enough decent fish in it. I was fishing downstream of Tates fishing the riffles and runs all the way down to the big pool where the river turns a corner. Fish were not only in the deeper pools, but in very shallow water, as long as it was fast and oxygenated. The duo works best there with a well hackled paradun on the dropper and a small size 20 pheasant tail with a 2mm tungsten gold bead 18 inches apart on the point. Would everyone who fishes Glenquay keep their eyes peeled for a rod top section. My friend lost his top section for his Sage fly rod. If you find it please contact me and I’ll collect it. Please, help me return the lost rod section to it’s owner. I plan to go up to Glenquey on Saturday and if I do I will keep an eye out for the tip section for you. I normally go for good wander during a session so I may be lucky and come across it. Was it lost on the South bank? Very much appreciated. My friend and I have checked from the car park all the way along the length of the loch and can’t find it. It’s black in colour so this makes it even more difficult to find. He got tangled on the fence on the walk up from the car park, but still couldn’t find it there. Shame because it’s a rare Sage One rod and irreplaceable. It would be something if you found it. Ok, I will keep an eye out for it. It may be easier to locate once the grass dies down a bit later on in the year, so may be worth trying again then if nobody finds it. The Sage One is fantastic rod by all acccounts. Here is hoping someone finds it for you. The Work Party has started strimming – the Airfield Area was the first to be tacked. Where is the airfield area ? Finally!!! I Was out tonight (Friday) on the river had 2 fish on a dry fly….. still very quiet but there is fish feeding! Not be long till the rivers back to it’s old fantastic self! Anyone else had much luck on the river? Wa out on fri night for an hour, conditions looked perfect, lots of flies on the water but no sign of any fish. The latest rise in tempreture should see it coming alive this week i hope. Well that was the hardest trout session I’ve had in years. The Devon has been very slow to come alive this year due to the late Spring. Good to open my account with three very hard earned trout. Two were on the dry dropper and one on the nymph. Another week or so should see it coming to life. It’s still very cold in the Devon Valley and at the Tates stretch, it was blowing a gale making casting difficult. The river now seems more active, went I stroll near the haugh during the week seen a few fish moving! During my lunch break, I went for a walk along the river bank at Tates Tomb back to the town and the river is still a week or so away from coming to life. Was annoyed to see a pile of pepsi cola cans just left on the river bank at the corner pool. Bloody lazy mindless morons who shouldn’t be allowed in the countryside. Spring is late this year, and by the second week in May, the river will be back to its normal wonderful wee gem of itself. Carron is coming to life and had 5 today, so the Devon won’t be far behind. The lads were saying that Glenquey is fishing well, so might head up during the week. Just back from a very good session at the Quey – the fish are up and on the feed. Had 11 to and and lost another 4 long distance. All came to a size 16 Black Spider. Cold up the quay today, managed one about 1/2lb on a size 14 PTN, sink tip line. Lot of fish started to rise around 2pm, just as i was leaving of course. One fish had a go at my size 18 black midge but i missed it, Still love it up there. Nice one Alan, were you fishing an intermediate or floating line? I’ve heard that howietoun fishery is up for sale, is there any truth in that? Was wondering if the Quey and river will be getting stocked this season. Good fighting fish that came from howietoun fishery. Neither the river or the loch needs stocked. There’s plenty of good fish in both and in line with most other rivers now who don’t stock, let nature take its course. As far as I’m aware it’s not getting stocked this year because of the situation with the fishery. Totally agree with you Cailean. Just didn’t know if the rumour was true. Summer mornings and evenings up the Quey is great sport. Plenty fish to catch. Looking forward to this weather taking a turn for the better. I return every fish i catch up the Quey. Just hope it doesn’t get hammered this season. I can confirm that the Devon and Glenquey will not be stocked in 2018. The decision was not taken lightly, but was prompted by the announcement last Autumn that the University of Stirling was closing it’s Howietoun Fish Farm. To the best of our knowledge there is no interest on their part to sell the hatchery as a going concern (Ian Semple who helped run the operation and is a good friend of the DAA did make overtures of running it independently but the University were not interested). That’s great news that the river is nor heing stocked and in due course it will become a wild trout fishery. As you pointed out, the fishing has not suffered at Fossoway and there are plenty of fish there. The only other river in our locality that is stocking this year is the River Carron and this is being reviewed next year. Many of you will have seen the big wild trout I caught on the Upper Clyde last week and this has not been stocked for 15 years and neither has the Tweed. Let the river become truly wild and bin the stocking policy unless some catastrophes destroys the river. Alan, I got one photo through (labelled No.3) ……. unfortunately I have also been bombarded with family photos this evening, so I suspect my mailbox may have been full for a short period! Him I will be rejoining the DAA after a gap of 20 years. I was wondering what are the best beats for flyfishing for trout these days. Anyone had any luck on the quey or river? We’re heading up Glenquey on Sunday. The river doesn’t come alive until May but you’ll still pick up a fish. Good stuff mate…. let us know how you get on! Water was devoid of any life so unfortunately we both blanked. This time last year I had 13 fish and today had zilch. It’s because it’s extremely cold and it’s needing a warm up to bring on the insect hatches and then the fish. It was looking stunning up there and it’s at a nice height. Give it a week or so to come to life and it will be leaping with fish again. Aye m8 its going to be a slow start. I was the same, got a couple this time last year but looking forward to the weather picking up and getting my line wet. Evening folks, anyone been out today? Looking to wet a line on the quey this Sunday…. does anyone know if it’s accessible and fishable? Will Glenquey tickets be available in either Bewicks or the new Mists of Time tackle shop in Alloa? I’m going for my river season permit over the weekend, but I like to fish Glenquey until the river comes to life at the end of April. I work long hours so it’s not always possible to obtain a permit at Muckhart. Jim Milne used to sell them before his tackle shop in Alloa closed. Cailean, the simple answer is no; Glenquey permits are available from the Paper Shop in Dollar, the Inn at Muckhart and at Monas in Muckhart (to the best of my knowledge Jim Milne never issued Glenquey permits). Our lease with Scottish Water and parking logistics limits the number of permits available for a single day …….. as a wage slave myself, if I need an early morning permits for Glenquey I head to the Paper Shop in Dollar! Hi everyone – with just a few days to go to the opening of the 2018 season, does anyone know how Glenquey is looking: is it fishable or is it iced over? Thanks in advance and have a great season. Drove past Castle Hill Sunday tea time. Narrow end at Glendevon village was iced over. Glen query is a wee bit higher, but more open to wind and sun. I reckon it will be OK.
Bloody spell checker – GlenQUEY ! I haven’t heard any comments about access up the Glenquey road, but I think if you fancy it this weekend it might be worth a recce first ……. I live further east in the Ochils and though most of the snow is away from the fields there are still so mighty drifts along the roadside (?parking). It would be great if anyone does go for a look or cast can report back! I can still see a few snow patches on the hills in the distance from where I am so goodness knows what it may be like higher up! The forecast looks bit windy and cold for this weekend so it may be next week before I venture out I think! Not long now till the new season….. when is the new river permits out? Well done and thanks to the work parties for improving the environment for anglers . I’m planning to try my hand at nymphing on the river this year, inspired by past posts on this blog. I would be grateful if some of you successful nymphers could give me some advice on leader set ups, nymphs and sizes for the Devon. I have a 10ft 4# rod and an impatience for the start of the season so a bit of chat helps wet the appetite. Cheers , Chris . A 4wt is too heavy for the Devon Chris as you’ll be using small tungsten bead nymphs in sizes 16 early season abd 18 to 22 for the rest of it. You’ll need a 9m long mono tapered leader. I use Diawa carp leaders and you’ll need 2 tone sighter mono and 2mm tippet rings. Give me a shout start of the season as I’m giving a lesson to some of the lads on the Carron. I use a 10ft 2wt on our local rivers and use the 4wt on the bigger rivers like the Tay, Clyde and Tweed. I’ll happily show you a few pointers on the Devon and anyone else who’d like to learn modern nymphing methods. I would be interested in learning nymphing techniques, never done it yet, been watching vids on you tube. If i can tag along that’d be great! Purchasing a permit for the Devon this year, never fished it but looking forward to it. Hi Steve, I’d be happy to help you. 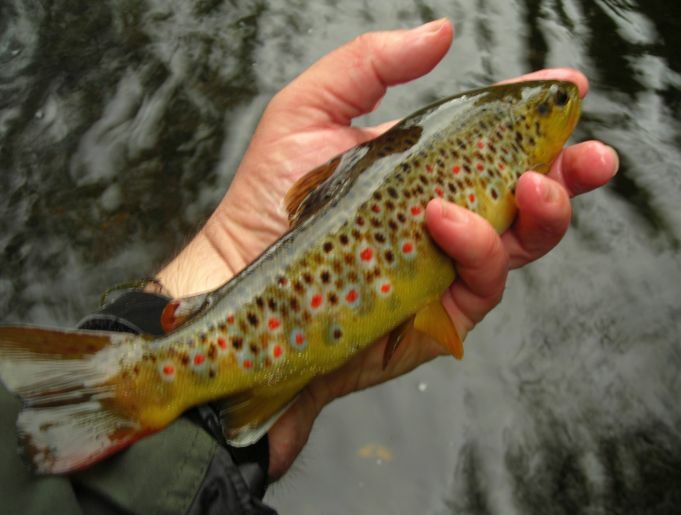 My Facebook group Upstream Nymph will be having one of our outings on the Devon in May and we have some top class anglers including guys in the Scottish international fly fishing team who will be on hand to help newcomers to nymphing. No not the orange or clear shock leaders. Those are for sea fishing and are too heavy. Its the Diawa Tournament Carp leaders which come in 5 per spool. I’ve just made a post on Upstream Nymph describing Euro leader set up in great detail or message or email me. It’s not difficult, once you know how. I recommend that you buy a spool of Diawa Tournament carp leaders which have a green label on the spool (NOT the SHOCK leaders for sea fishing! ), tie on about 18 inches of 2 tone sighter such as Hanak or Rio as it’s readily available and a small 2mm tippet ring to the end of the sighter. Tie your tippet to the tippet ring. I use 3lb or 4lb Stroft ABR, but use your own preference, then 2 or 3 nymphs to the end about 18 inches to 2 feet apart, depending on depth and speed of water. Don’t start with a short tippet as a longer one can be shortend, but a short one can’t be made longer. Easy way I do this to start off with is have the sighter out of the top rod ring and tie on your tippet. Cut it at your first rod eye (above the handle) and this is your first dropper, then from there to half way down the handle is your length for tying on your point fly. This is fairly accurate for starting off for fishing most pools and can be shortened if required. This tippet is also shorter than your rod, which means easier landing of your fish. I visited Bailies in Kinross this morning to pick up my permit but was told they are not available yet. Can you tell me is there any online method to buy a permit? Failing that when can i pick one up at Bailies? We don’t have an online permit (something we will be exploring). Unfortunately last week’s weather postponed the distribution of permits to some of the outlets. Apologies for that delay and your trouble, particularly and ironically,as the permits were delivered to Bailies this afternoon! Castlehill has a new owner, apparently he also runs the lomond hills fishery. He has created a pike fishing club, therefore castlehill will be pike fishing only, from what I read on social media he expects member to monitor the water for poachers etc, castlehill seems to be a favourite for poaching! Yes, I have seen cars with fishing gear in the layby recently. I pass by the reservoir every Friday and Sunday night. I may start noting registration numbers…. I hope those that are chased off don’t end up fishing DAA waters, bellow the dam gets hammered every summer with the young team camping, although from what I’ve seen they just leave a ridiculous amount off rubbish, in and out the river don’t think they actively go out to harm the trout! Seen a few post concerning a huge number off roach apparently castlehill is full off them! How did everyone get on this year? I personally think the river fished better last year, few funny days/nights where not much was happening although there was plenty off hatches! Glenquey didn’t disappoint think I landed fish ever trip, some days better than others, but always catching fish! Not the best of seasons for me on the river but that was mostly from not being able to choose my time due to other pressing requirements. I have however really enjoyed the last 6 six weeks; its nice to fish familiar waters at different water levels with different techniques. Finally day was a cracker for me, river up a bit fishing with a dry fly to the occasional riser and netting some cracking fish. I had a very slow start this year. Possibly as I was trying new methods like upstream nymphs, etc. Just a thought about the river these days. For as many years as I can remember many keep able fish were killed and taken home to be eaten – that was the way. Over the last few years I am pleased to meet so many anglers who catch and return all fish – perhaps with a photo of the better ones being enough of a trophy. I feel that this has increased the number of better fish in the river hugely. The longer we all keep this up the better the catches will be. I have never caught or heard about so many bigger fish being caught in the river. I had a good few beautiful male fish, starting to develop a Kype, I’ve not caught many on the Devon but definitely caught them in abundance this year, very strong fish few times I had to take a walk down river too keep up with these fish always a relief to get them to the net! Just in general I think I netted more fish last season than this season! Hopefully hear off a few salmon being caught this season, plenty salmon run up the Devon but seem to do well avoiding fishermen…. also seen a few pink salmon being landed on the river leven, any reports off them on the Devon? Here’s good Site http://www.therrc.co.uk/ river management. Kenny good spot the River Restoration Centre offer some great advice about managing and improving the riparian environment. The DAA actually commissioned the RRC, a few years ago, to survey the DAA section of the River Devon and produce a report for the Association to help inform the long term improvements of the riparian environment. Two of their experts spent a few days on the river and subsequently produced a detailed report which provided the Association with a template for management of the catchment which has been subsequently incorporated into our Catchment Management Plan. Hi folks, any thoughts on best methods and flies for brownies nearing the end of the season on the river? Also i have a sea trout and salmon permit this year but have never fished for them, any advice on flies and locations welcome, thanks in advance. cheers, christopher. The end part of the season is very much like the beginning of the season as Large Dark Olives and March Browns make an appearance again in good numbers, even though LDOs are one of the few flies to hatch all year round. Small brown sedges are also interesting the trout.Two spiders work well with a nymph on the point. Waterhen Bloa or a Greenwells Spider for the LDOs and a Winter Brown for small sedges and needle flies. Nymph on the point is a Greenwells nymph, a pheasant tail nymph or a gold head hares lug. As the river is at a good level French nymphing comes into its own too. I wouldn’t argue with Cailean’s choice, however at the tail of the trout season I tend to stick fishing with dry flies imitating LDOs but have had a lot of joy at this time of year fishing with large deer hair based sedge patterns (such GH Sedges) which seem to bring up bigger trout. As for Salmon, well for the first time in a few years Castlehill is full late in the seasonso any decent rain should bring spates to the river and encourage Salmon to the river. I am no expert but I tend to keep it simple fishing shrimp patterns on a floating line with a sink tip. Cumbus below Tullibody or the carvan park dollar. Sea trout like movement. In the flys . Salmon it’s all a bout luck. All so go to cambus falls about September near the end of the season. Take a tourch and you will see the salmon. Best at night. Try fishing small salmon flies on a floating line – size 12 or 14 doubles. Even on a single handed rod. Maybe a shortened sinking head if there is plenty water – to get down a bit. Plenty of room to fish salmon flies from the Haugh downstream and especially down from Taits Tomb. Its a small river, so Salmon can be as spooky as trout – try keeping back a bit from obvious sight and if you can, dont wade. If there are fish in – you’ll see them – don’t tarry too long at a pool unless you see moving fish. If there are fish in a pool, you will usually spook them at least and they will leap ! Dont be afraid to cover the small deep lies too – its amazing where a salmon will lie up. Sometimes in pools with hardly any casting room. A simple spey lift and flick will put a fly across most lies. If fish are in and the water drops to low – try wee tiny 1/4″plastic tubes tied “riffle hitch” to cause a wake or disturbance across the surface to stir them. Red Frances are ideal. If all this fails – try a short throw of the complete rod and reel into the deepest pool around and go for a pint to ponder maybe taking up golf !!! Graham, there’s me thinking jinx this lad is making sense of this salmon fishing malarkey right up to going for a pint ………. but taking up golf ???? Hi Chris, Going for Salmo Salar and his Silver Brother of the tide is difficult . For Salmon on the Devon I have found ALLYS SHRIMP and the CASCADE highly successful over the years. Carry these in size’s from 10’s through to 6 (dependant on river level. As for Sea Trout Silver stout Red Stout are my first choice. At the back end any fly with Orange / Yellow and black combination should hopefully provide you with sport. However bear in mind both of these are NOT FEEDING fish when they enter the river so it can be very frustrating. Work Party been busy strimming again. Go out there and discover where we have been. And while your there pull out some Balsam please !!!!!! On days like today, fishing the quey takes a lot of beating. Amazing scenery, ospreys, and enough surface activity to keep the spirits up. Ended up with 8 , 6 on a Loch Ordie wet size 14, one on a size 16 black buzzer and one on a pheasant tail nymph. The loch Ordie wet on the top dropper was doing the business on a slow figure of eight retrieve. 8 fish is my best session up there. I know others hit double that but i would have been happy with one in such stunning surroundings. And all for 7 quid for the day. Hats off to the D.E.A. Glad you enjoyed your session. As you say never mind the quantity just feel the quality. Fantastic place. Hi Folks, was watching a video by Nick hart last night on small river fishing for trout. He was using what he called a New Zealand style leader. Dry fly on dropper with a nymph on the point. He also called it a Duo. I went down the river for an hour this morning upstream from the lovely new bridge at lower mains(thanks to the working party) with a brown and white klinkhammer size 14 on the dropper and a gold beaded pheasant tail nymph size 16 about 3-4 feet down on the point. Had 4 fish in 30 mins, (barbless hooks and all safely released). Will be using that again, i guess its hedging your bets for fish at different depths. 3 on the nymph and 1 on the dry. I thought the nymph would pull the klinhammer under but it stayed up and acted as a useful indicator. Just thought i would share what works, . Would love to hear more detail on here about others useful set ups as it all helps the learning, cheers, chris. Another vote for the duo or as I like to call it the klink and dink, I prefer dry fly fishing but there will always be fish hugging the bottom, I will usually start with this method, and if there isn’t much happening on the dry and getting fish on the nymph, I switch to more conventional euro nymph techniques which on its day blows all methods off fishing out the water! The duo works well on the deeper runs on the Devon. On the faster runs, I prefer 2 nymphs on a French leader. I had some lovely trout yesterday despite the coloured water. I’ve not seen the Tates Tomb stretch so busy with anglers for a wjile. There were quite a few out yesterday. Normally I can fish that entire stretch without seeing another angler which is the attraction for me. Good to see youngtsers out learning to fly fish. Kids are the future of our river. Hi folks there is a bit on police Scotland a bout lures . On there face book page. Can’t copy and paste it. If eny one can’t put it up , just to keep every one who is spinning on the right side. Kenny, can you recall which division of Police Scotland’ the facebook post was on …….. I had a look and couldn’t see the post? Police Scotland forth valley. Go to photos and klick on the salmon photo. Thanks Kenny ….. found it! Just heard castle hill is closed all boats sold . Well will we get more poachers up at the Reservior !!!!! Below castle hill some mess with rubbish.lifted two black bags . Hi, someone might like to notify the sheep farmer at Fossoway that one of his ewes has recently met its demise. It’s lying on the embankment about a thousand yards downstream of the bridge where a single fence post is sticking out of the ground. The guy is a decent sort and the poor thing most likely fell, but if it didn’t and there’s a priblem it’s better he knows so he can treat his other livestock. Fantastic Alan….. I am heading up tomorrow probably night time hopefully for some action! I’ll mind the yellow owls! The work party strimmed the area from Rackmill down thru the Haugh to-day making access a bit easier for those who fish in this area. Once again I would remind you all that Himalayan Balsam when seen should be pulled up by the roots and put well away from the River side – thank you all for co-operating with this. It’s pull it out or you could find access difficult. The work party can only do so much thanks for your anticipated help. Was fishing the haugh last night and it was very overgrown, still managed a nice brownie on the dry about 10pm. Thanks so much to the working party for their work today, look forward to getting back down there later in the week. I will continue to pull out some plants eat time i visit, cheers guys. I’ve found what looks like a brass house key with a black handle. If anyone is missing there’s from the car park at Tates Tomb, let me know. Cailean, I will put a post up as well to give it some prominence! Was coming on here to deliberately….. thank and mention what a fantastic strumming job has been done at the haugh!! Fishing was hard going tonight, managed 4 all on euro nymphing techniques, was joined at the river side by young lad maybe 7/8 years old and an older girl maybe 10/11…… not sure where the parents were both were on their bikes…. young boy was standing quite about away watching, just so happened I hooked up to a fish, as I was playing the fish I seen him gradually coming closer, I netted the fish, then asked if he would like to release it……. over he come and to my surprise first thing he did was wet his hands! I asked have you been fishing before surprisingly the answer was no…. the older girl replied with ” this is the first alive fish he’s touched, but papa always said that if your touching a live fish always make sure your hands a wet ” the fish swam off safely! The delight in the young kids face was indescribable, truly a wonderful moment, Hopefully this experience will encourage him not to come down to the river on his bike, but with a fishing rod!! Well headed up on Saturday and as I was setting up got speaking to another angler Gary. We were both new to the stretch and decided to fish it together. The weather was miserable and felt more like march than June so I decided to start on nymphs with a French leader. Almost straight away we were into fish. There was some flies coming off with the odd riser so I put on a wet olive which Gary had gave me. The next two fish were on that although the orange collared hares ear was the top fly of the day. Managed a few on the dry later on when it brightened up a bit. Absolutely shat myself when I came out of some bushes at the riverside to cross and there was a red deer on the other side which had managed to get out its field. All in all a good day with lots of new water explored, good company and a few fish thrown into the mix too. Yeah was at fossoway it is shallow but some nice water. Yesterday I had my best session so far this year on Glenquey. The term fishing it’s head of is an understatement. Hares Lug and Partridge size 16/18 or Black Spider 16/18 took all fish. Hi just thought I’d quickly introduce myself. I moved to Alloa from Edinburgh last year and although I had a permit for the river only managed a couple of trips. This season I’ve decided to fish a lot more and have had some success recently after a slow start. Really enjoying exploring new water and getting to know the area. I’m off tomorrow and was wondering if anyone knew what the clarity of the water is up fossoway area? Hi Scott, think half of our group want to head up Fossoway now after info was posted about it. I’m heading out next week on a weekday as the river is usually quiet then. I wish they’d sort out the no Sunday fishing rule as that’s my only day off. The no Sunday fishing rule is a pain but it does have the advantage of giving the river a rest for a day from angling pressure. I totally agree with you about value. The permit price is superb value for money and having one also gives a discount for a day on the loch. As for the Fossaway beat I got a glance from the car as I crossed the bridge on the A91 at 6am this morning and about 40 minutes ago on my way home. The river here is up a wee bit from last week and looks like it’s running clean. Thanks for the replies guys. Will head up there tomorrow then since it’s clear. As for inaccessible bits that’s half the fun although I’ve had a few dodgy moments in the past on other rivers trying to scale bits that a mountain goat would think twice about! Welcome Scott, I fished the fossoway tonight (Friday) water is higher than usual the slow deep flats seem to have a bit off colour nothing drastic…..above the dam on the fossoway stretch is a favourite dry fly spot for me believe it or not, letting the slow moving water push my balloon caddis slowly downstream and a short but sharp figure off 8 just seems to get them going…. tonight, interestingly the colouring off the water was showing the trout off as they were coming up to take my balloon caddis off the top, you could see the trout making its way up to the fly (often was just a flash) but majority just sort off slowly making its way to the fly and taking it off the surface…. truly amazing too watch even when you do miss them!! was on the river tonight and it was coloured but fish were rising and managed 2 (both returned safely on a barbless size 18 black spider, quite a few more had a splash at it. The work parties have been out and about. They have been strimming at Balquorn and the Airfield area so those of you who fish these areas of the river will find access much easier. Work parties are held every Wednesday and anyone who wishes to come along please contact us via this site or any member of the committee on your membership card. Balquorn is between Alva and Menstrie while the Airfield is in the Alva Area to reach this turn left down the Alloa Road which is opposite the town clock. Both areas are best suited to bait and spin fishing. Hope this helps. For Fly water try Vicars to Dollar Weir or the Fossoway stretch. For the latter you can park at the Fish Rearing Plant just before the Fossoway Bridge. Is Cambus covered by the permit and is it worth fishing? Simple answer is no, the DAA downstream limit is at the Tullibody Bridge (Menstrie – Tullibody road). The fishing downstream is retained by the riparian owners which in the case of Cambus is Diageo. The River has really come into it’s own now. I had 12 cracking fish while fishing the duo last night and they really switched on at 8.30pm to 9.00pm as the light started to fade. Photos and video on my Facebook group Upstream Nymph. My friends are also doing well on other stretches fishing French nymphs. These have been good for me this season too. Some fantastic fly hatches recorded with multiple species including Epherema Danica, the true Mayfly. Already the sedges have started to put in an appearance so late evening sport is looking good for late June and July. If anyone wants help with learning French nymphing, say hi on the river and I’ll be happy to help. I’ve taught hundreds of people over the years for free and it’s great to see them taking what they’ve learned and catch fish. Long may this season continue to be a good one. I can only concur, I have seen a few relative short but incredibly intense hatches with quite a few exotic looking mayfly species …….. either side of these hatches the dry fly fishing has been excellent (dark CDC emergers have been the fly of choice) no heroic catches but just a steady run of quality wild fish! The week’s forecast looks like we might get a wee freshen up but with Castlehill so low it is unlikely we will have a spate! Its well worth looking into Cailean’s technique of choice, French Nymphing and his Facebook group ……. the keen fly angler will learn a hell of a lot! Had a brilliant day on Monday – fly life in every pool and riffle – GRHE nymph or a CDC emerger in sizes 14 and 16 worked for me. I’m going up tomorrow night. Hope theres not too much water. It’s a big challenge to change a lifetime of across and down wet flies or nymphs, but never say die !!! If the river is high and coloured, might head up the Quey. If not the wee 20s will stay in the box and the 3.5mm tungstens will come out. Great to see so much fly life and the river fishing so well. What’s the best flies for up Glenquey this month? Tiny buzzers and emerges static or barely tweaked about 6 feet in front of moving, feeding fish. It may be time, although early, for a dry daddy static but just tweaked if flat calm. Make sure leader is sunk. Cheers mate. I’ll give it a go. I’m not much of a Stillwater angler as rivers are my forte but love it up Glenquey. Vicars brigade camp site cleaned up to day. Three bags of rubbish lifted. Thanks Kenny …….. I am sure that will be appreciated by not only anglers but also the other recreational user of the area. Bumped into a mink, just bellow the dam wall on the fossoway run last night, it was across river and heading downstream, once roughly in line with me, it stopped we made eye contact, it then continued on its way, few minutes later it appeared on the same side off river as me with dinner in its mouth ( some sort off a Rodent not a fish ) it come bouncing up the river bank not a care in the world and was literally touching distance away before it veered away into the longer grass, it then crossed back over the river few meters away, carefully navigating its way over the dam rocks before heading into the woods!! Had a good afternoon on the Devon with the new 2wt. A peach of a rod for 88 quid. Still shaking from the fish I lost at the net. Easily my pb on the Devon fish and was around the 5lb mark. Not bad for a wee stream and a 2wt. Caught some big bruisers today at the head of pools where the fast water comes in. All were caught on size 20 French nymphs for a total of 8. Photos available on my Facebook group Upstream Nymph. well done mate, I’m getting lots of luck on a size 18 small black dry but only very small fish, will need to give your advice a try in the hope of landing something bigger. Must be fun with the 2 wt rod. I fish a 4wt on the river and at times don’t even know that i have hooked some of the small ones. A 5 pounder on a 2 wt must have been fun. Off to tie up some leaders with nymphs . Just back from the “Quey” had my best session so far this year. Lots of Olives hatching and the water is now dropping back nicely. No nasty surprise’s when I got back to the car this time. good for you mate, what were the fish enjoying today? Found dead gold fish ,were the mine water comes in. Kenny that is very very odd; I presume you saw no other signs of distressed fish? It may seem an innocent (and stupid) act by the gold fish owner, but these fish are particular susceptible to disease due to the way they are bred and raised; they shouldn’t be coming into contact with wild fish. I was fishing down from Vicars Bridge yesterday – a good rise came on early pm for over an hour or so with a strong hatch of upwing flies – two or three varieties including big Mayflies. Couldn’t find the right fly to entice the troot ! However, it seems that the mine treatment pond isn’t doing much – where it runs into the river the whole bank is bright orange for a few metres – maybe the pond and filter area is choked and needs a clean out ? I did pull out a hundred or so of these Himalayan plants though – cleared a corner bend and only took about five minutes….. The DAA (and the Fisheries Trust) are aware of the current discharge from the treatment works and both SEPA and the Coal Authority have been contacted. The problem lies in the treated water not spending enough time in the reed beds (the majority of the flow runs along the north bank of the reed bed rather than generally over the whole area). The treatment system is working (the majority of the sediment is being captured) and the sediment is harmless other than it coats the river/stream bed making life for invertebrates impossible. It is disappointing that the new system is less effective than the old one but hopefully we will hear from the Coal Authority presently with their proposals to rectify their treatment system and prevent further pollution of the river. As soon as we have any news on progress I will post it here! Cailean It can’t find your net I can give you a wooden net. Thanks Kenny mate for the offer. It’s very much appreciated but I’ve placed an order for a new wooden net as a replacement. If anyone wants their net converted to a floating version give me a shout or if you want to make your own give me a shout on Upstream Nymph on Facebook. Had another great time fishing Glenquey today, taking a nice fish early on,fantastic place. However on my return to the car someone left a note on my windscreen saying “this is a car park for fisherman only , your car may be clamped next time”. I feel whoever left this has totally misjudged the situation and made me and others feel unsure whether paying for a permit to fish Glenquey will later result in a very expensive day and unworthy hassle. This situation really needs to be resolved as I love fishing this location. Please let me know what I should do , can leave a note “Gone Fishimg” if required. Just really feel it was unfair to pay for the permit and be welcomed with this response, let alone had I been clamped, who would be responsible for the costs ? Apologies on behalf of the DAA …….. I think there may have been a case of mistaken identity. We do have an occasional problem with walkers (with or without dogs) using the limited parking space and I suspect our resident bailiff my not have seen you on the reservoir and put 2 & 2 together. I expect he was just making a (mistaken) point but a note would do no harm …… I will pass on your experience to officers of the Association. Hope it didn’t sour the day too much! Thank you for the reply, I had a great day and will be returning this coming week. I think I was hidden down the far end trying to keep out the wind. I will try to leave a note next time as I do agree it’s a hard thing to enforce and appreciate having the car park so close to the resevoire. It’s not letting me reply on the lost box post, any information on where the angler was on the fossoway beat? I personally am up there regularly and know the stretch very well…..any landmarks that the angler can remember they fished that day, Ill have a scout next time am about! As for the fishing, 2 fish is the most I’ve had in one session from the river fished euro nymph techniques without a tug, late at night there is some movement enough for the dry fly angler in me to put a dry on, but their not interested in them either….. team off wet flies have done the business for me particularly a black spider!! Andrew I don’t think you need exercise yourself about the risk of being clamped by the DAA! Thanks for the offer of help looking for the missing flybox ……. I was at error by forgetting to allow comments on the post but I have added your kind offer to the post! Lost my floating net I use to release my fish. It’s a Leeds scoop net with grey foam insulation I fitted to it’s frame. Was downstream from Tates Tomb and I was parked in the big lay by there. Anyone finds it please let me know. James I had one on my car two PLUS a Flat tyre !!!!!! Thank You to Devon Angling Association. I received a voucher for a free days fishing at The Quey through the post today after posting my day ticket in the collection box at the reservoir. I reckon a lucky day awaits me. The DAA put all the catch returns posted in the box each month into a pot and one lucky angler is drawn for a freebie at Glenquey! A request to all Fisherperson’s on the River Devon. You will be aware that many areas are infested with Himalayan Balsam. During the months of May June and July we would ask you all to take 10 – 15 minutes of your time and PULL out AROUND 50 OF THESE PLANTS. Leave them well away from the river bank to decompose. This way will go along way to helping the committee to eradicate this Non Native Invasive Species. Thanks for your help. At the moment there are 4 young guys fishing from the south bank where the river bends before flowing past Sterling Warehouse – very frustrating to see. Michael aplogies for the delay in this being posted; as a new contributor you have to be approved, which stops the website being deluged with spam (typically 50 – 100 comments a week). I will pass you comment onto the bailiffs, who I am sure will take a run that way on future Sundays. How is the river fishing after the mild weather we’ve had? Hopefully the river is warming up and the fish are coming on to the fly life. Hoping to get a cast next week. Hi All, going up they Quay on Saturday and wondering if anyone has tips on flies and leader set up including breaking strain. Weather looks about 9 degrees with cloud and sun at times but a bit windy . Been up 6 times with no fish, thanks in advance, cheers. Hi Christopher, it’s still early doors, I would go deep and slow, vary what you are using until you find something that works. After 6 previous blanks I finally managed my first fish on the quay , ended up with two on a size 16 hot spot pheasant tail niymph on a midge tip. Great feeling catching your first fish on a new water . Well done mate! Onwards and upwards from here! WHAT AN AFTERNOON ON THE QUEY………. not good fishing tho, absolute madness in that wind!! There was a tremendously strong north western wind, casting on the south back was extremely difficult, headed over to the north bank in the hope to get the wind at my back (sort off) got down the ladders walked over the outlet, come to the rope ready to pull me self up the wall…… huge gust off wind and a slip later, ended up looking like Tarzan gone wrong, clattering against the wall luckily no damage done! Is the association got any plans for improving access to the north bank? If that was an elderly or less stable gentleman god forbid that could have been deadly to be honest! Used the rope myself on sat and it does require a bit of effort. Not advisable for anyone with limited mobility. The alternative is a 15min walk back to near the car park where a path takes you to the other bank. Certainly a fixed metal ladder as used on the other wall would be a huge improvement. Andrew, good to hear that you did not come to any serious harm, but in the process you have raised a serious point which requires addressing. The recommended route to the North Bank is the path described by Christopher where there is a footbridge over the burn or the long way round [I will put up a map showing the route on the website later this week]! When the level drops in the reservoir it is possible to bypass the overflow walls but at other times we have to recommend the path. I am told that once upon a time we had ladders there but they were removed by Scottish Water and it is unlikely that they would approve of either the existing rope or ladders on their spillway. Christophher good to hear you finally got your fish!